SKU: EWOOD-1. 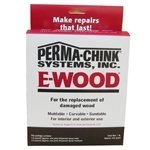 Categories: Perma-Chink, Wood Repair. Tags: E-wood, EPOXY, Epoxy Putty Wood Restoration System, ewood, Wood Restoration System. E-Wood Epoxy Wood Filler is a putty-like, non-shrinking, epoxy filler used to fill in missing sections of logs or dimensional wood members to restore strength to deteriorated wood. E-Wood will form a permanent bond to most rigid surfaces. Porous surfaces should always be treated with a compatible, low viscosity epoxy system such as M-Balm. Use E-Wood Epoxy Wood Filler to replace missing sections of window sills, frames, furniture, or any wood structure. Use it to add new sections to completed structures. After repairing with E-Wood Epoxy Wood Filler, restored wood can be shaped with your normal wood working tools, including saws, sanders, planes, routers and drills. With disposable gloves, combine E-Wood Epoxy and Hardener. Do not mix more than can be applied in 15 minutes. Coverage rate is 1.8 cubic inches per ounce mixed A-B components. Apply over wood that has been treated and sealed with M-Balm. Mold to rough finished shape within 30 minutes of application. Hardens in 2-4 hours depending on temperature. When cured, sand, nail, carve, paint, or stain as desired. Clean up: Uncured E-Wood may be cleaned up with white vinegar then flushed with water. Be the first to review “E-Wood Epoxy Wood Filler” Click here to cancel reply.